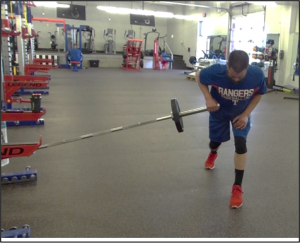 If you find your team on the road in a gym that doesn’t carry heavy dumbbells (DBs) or just looking for an effective alternative to standard rowing exercises, try the one arm landmine row. It’s an effective single-arm exercise performed from the ground up that will strengthen the upper back, work the biceps and enhance core and shoulder stability. Because it is performed from a two-point stance, there is also a strong demand on the trunk to resist rotation. And, because you are griping the end of a bar, which is much thicker than a traditional DB, it will help with grip strength. 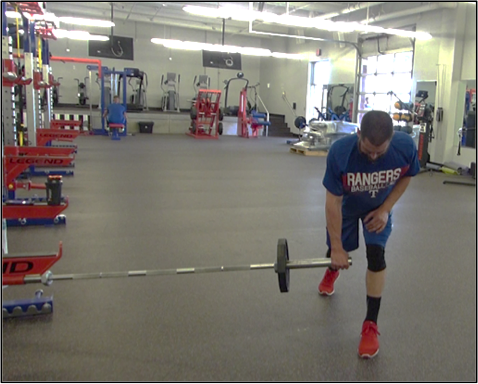 You can perform the exercise with the bar parallel or perpendicular to the body. For the purpose of this post, the following discussion will be limited to rows performed with the bar perpendicular to the body. Stand at one end of the bar with your feet in split-stance with the inside leg back and the outside leg forward. Position your trunk so that your chest is just above parallel to the ground and your back is flat. Position the arm you use for the movement with the shoulder directly over the end of the barbell. Place the elbow of the arm farthest away from the barbell on your outside knee to help stabilize your lower back and pelvis. Set the core and maintaining a flat spine, row the barbell up, driving your elbow up and controlling the movement back down into a stretched position at the bottom. Perform the prescribed number of reps, rest 1-2 minutes, rotate the body so that the opposite side is perpendicular to the bar and repeat the exercise. Do 3 sets of 6-10 reps on each side with 2-3 minutes rest between sets. Maintain a “neutral” spinal position throughout the movement. There should be a straight line from the back of the head to the sacrum. Keep the trunk as straight as possible throughout the movement to prevent rotation at the top and bottom of the movement. Push your hips back, keep your knees soft (don’t lock them out) and keep the core tight. Pull through the elbow, i.e., pull the elbow towards the hip, not past the hip. Pull and lower in a controlled manner, don’t jerk or drop the bar. To enhance range of motion, load the bar using smaller plates (10’s or 25’s). Smaller plates allow more room than larger plates for a deep stretch in the bottom position. If you don’t have access to a landmine apparatus, place the barbell in the corner between two walls and perform the exercise. Increase resistance by adding more weight. Position your feet in in a shoulder-width stance with both knees bent. Change body position so that the body is parallel to the bar.